Whether you want to save space on your desk or enjoy using your PC through your television from the comfort of your couch, the Logitech K400 Plus gives you convenience and reliability at a great price. This stylish keyboard with comfortable, low-profile keys provides long range, reliable wireless control which is perfect for the living room or as a compact desk keyboard. With a wireless range of up to 10 m (33 ft), you can turn up the volume of your favourite video, browse the web, blog, chat and more, all from the comfort of your couch. The K400 Plus ultra thin keyboard with low-profile keys is compact but still provides comfortable, quiet typing. Store it upright for added convenience. There's no need for a separate mouse thanks to the 3.5 inch built-in touchpad which also has large left- and right-click buttons. Pop the tiny Logitech Unifying receiver in a spare USB port and leave it there. 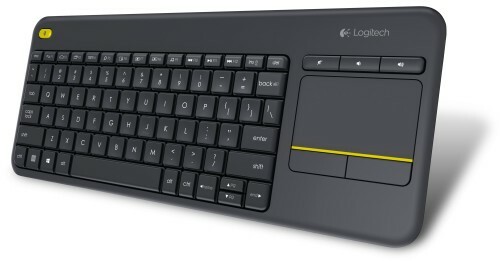 You can even add other Logitech devices using the same receiver. Plug it. Forget it. Add to it. We offer the latest version of the K400 Plus which has dual-purpose function keys to help you navigate the Windows 8.1 style user interface. The Windows Start key provides an easy way to get back to your start screen. The App Switching FN key allows you to quickly switch between your open apps. There are four Charm keys which give you direct access to the Search, Share, Devices and Settings charm functions. The Application key brings up the application bar for navigating through your browser tabs. As well as Windows 8.1 the K400 Plus is also compatible with the following: Windows 7, Windows 8, Windows 10, Android 5.0 or later, and Chrome OS. In addition, the K400 Plus features Media Hot Keys at the top left corner of the keyboard. Now you can enjoy one-touch easy access to your most often used media hot keys like mute, play, volume up or volume down.